Lennie loved photography. 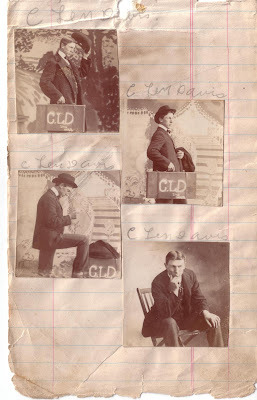 Earlier I mentioned that his diary included postage-stamp size photos. But I was mistaken. There are TWO little books in Hubby's possession. One is Lennie's diary. The photos are in a second pocket-size booklet. I've found the album but cannot find the diary itself. Several years ago I had typed those entries and made copies for family and I am posting from that typed copy. But I cannot find the original diary. I know it's here somewhere. But where? Here's a pic of the photo album. As you can see, there are numerous pages with 4 to 6 photos each page. Many must be Lennie's classmates. But many photos are later when Lennie was a young adult in his early twenties. I've already posted Lennie's diary entries for February 1 and 2. So today I'm just going to show you some photos from his album. As you can see the individual photos are less than an inch square. I've scanned them at a high resolution to produce this copies. I especially like this page where Lennie has included four portraits of himself. Note that his suitcase is marked with his initials. (You can click for a closer view.) Here's another member of the Wakefield Cornet Band. But I don't know his name. He must have been a friend, though, for Lennie included his photo in his little book. Below is a portrait of Lennie's brother-in-law Charles Emil Schulz, and his wife Flora Olive Davis (Lennie's sister). Lucile in the front row is their firstborn, born in 1899. This photo must have been taken about 1903. The little girl in the background is possibly a Davis relative but I do not know for certain. 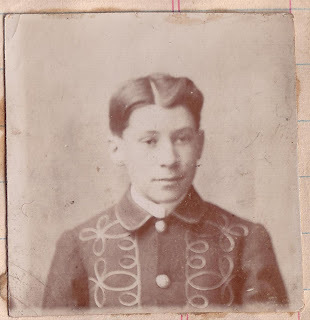 When he was a teenager Charles emigrated here from Germany with his widowed mother, Albertina Schmidt Schulz, and his siblings Maria Louise Helene, Anna Louisa Marie, and Frank Rinhold Schulz. Ollie's family, on the other hand, had been in this country for at least two hundred years (and as of this writing, three hundred years!). Ollie may be pregnant in this photo with little Lucile's brother, Leonard, born in 1903. Sadly, Ollie died in childbirth in 1908 with the couple's third child, Charlotte. 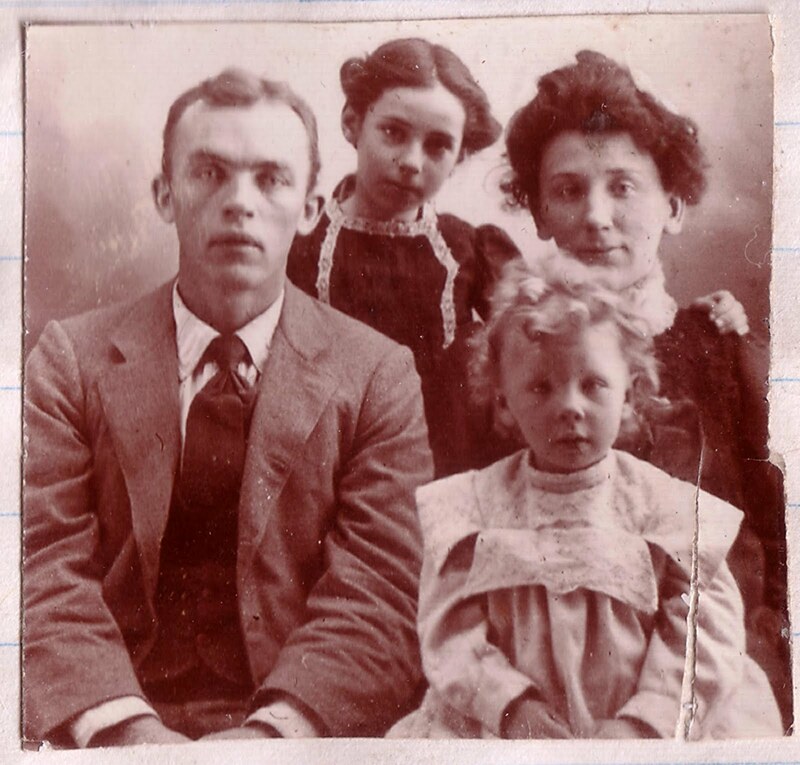 But Lennie does not yet know that when he pastes this tiny photo of his sister and her family in his album. There's something quite poignant about that last paragraph. I, for one, am glad that only God knows our future.